My dogs always tries to lick my feet – why? It still amazes me the amount of times I am asked this question! The licking in questions varies from the occasional licking of feet, right through to the dog that is totally obsessed by their owners feet. The worst case I ever saw, was a Jack Russell, that stood next to his owner, watching her shoes in anticipation of them being removed – body was trembling with high anticipation, eyes were fixed on the shoes and the dog was panting – as she moved, the dog moved with her. What did not help the dog, was that the owner always changed her shoes from high heels to flat shoes the second she came into the house – the dog was anticipating the behaviour and just could’nt wait! Because it is important for survival, it is not surprising to find that taste is one of the earliest senses to begin functioning in dogs. Young puppies seem to have only their sense of touch, taste and smell working at birth but the taste sense still requires a few weeks to completely mature and sharpen. Humans win the sensitivity contest for taste, with around 9000 taste buds as compared with only 1700 for the dog, but dogs have considerably more taste buds than cats, which average only about 470. So, why do so many dogs engage in this behaviour? ​Just as how dogs identify you by your distinctive odor, they can also clearly recognize you through the taste of your skin. Based on the taste of the salts released from the pores of your skin when you sweat, they are able to recognize and recall who you are. Once they lick and register those taste markers for different people in their minds, they can accurately identify who each one is and reassert their memories with every fresh bout of licking. Some dogs also lick because they like the salty taste of your skin. It may sound strange, but it’s possible that your dog might be able to tell your feelings by the way that your skin tastes. If they can figure out how you are feeling, then they can better understand how to please you. Is It a Breed Thing? I've found that sighthounds (Greyhounds, Italian Greyhounds, Afghan Hounds, Whippets, Salukis, Scottish Deerhounds, Irish Wolfhounds, Borzoi, etc) are not very licky. There is variation between individuals but I've never met one who licks like a Lab (or any other retriever). I have Italian Greyhounds, spend a lot of time with Greyhounds and have spend some time with the other sighthounds. My own dogs will give me the occasional swipe or two but generally only lick if they need fresh water. Out of over 100 Greyhounds, one was a big licker. She licked my hands, face, and glasses while I was holding her for a photo and got my husband's face and the camera in between shots. The others may give a quick lick but nothing more. Breeds that have been bred to use their mouths (think retrievers) tend to be more mouth-oriented and lick a lot more but there's still a lot of individual variation. My husband's miniature dachshund would lick any exposed body part (she was especially fond of feet) for hours. She would just methodically lick until you forced her to stop. She wasn't quite normal and licking was her way of soothing herself, the same way a child who is generally past thumb sucking will still go for the thumb when stressed. Attention Seeking – if the dog discoveries that every time he tries to lick your toes or feet, you award him with attention, he is just going to keep on engaging in the behaviour. What we need to bear in mind where dogs are concerned, is that attention to a dog is attention – whether negative or positive. The dog could receive attention in the way of an excited squeel from the owner that has ticklish toes, the shout from another owner who hates the behaviour, or the owner who allows the dog to engage in this behaviour and both of them seem to like it. Social Grooming – This happens right from the mom licking the pups when born, pups and dogs licking themselves and one another, and our dogs licking us. studies have shown that licking can simulate the release of positive hormones such as oxytocin, which is associated with emotional attachment, and bonding. Stress Relief – Many dogs that are really anxious will engage in repetitive licking as a way of calming themselves down. This behaviour can really become obsessive, and unless the reason for the excessive licking is identified, and addressed, the dog can develop what is called acral lick granuloma/symdrom. This is when the dog will lick itself, in the same place repeatedly, until it is raw. This condition can also be caused due to physical problems, however, it is not unusual for the condition to occur due to severe stress. Taste - Some people say that your dog is trying to lick the salt from your skin and studies show that dogs can indeed taste salt. Salt flavors can stimulate nerves in dogs and they can perceive the taste of salt, so maybe this is the reason for some dogs. The act of licking and being licked stimulates a release of positive hormones for dogs. Studies have shown that for many species, social grooming stimulates oxytocin (a hormone associated with bonding and emotional attachment). Maybe your dog licks your feet because she wants to show you love. To Gather Information - Another reason dogs lick human feet is to gather information. A dog is able to use the millions of scent receptor cells in its nose and mouth to process information. As a human body secretes, the sweat released relays information regarding the individual that the dog can process. Sweat glands release moisture that contains salt, water and waste products. Sebaceous glands release sebum and are located near hair follicles. The sweat can mix with these secretions to provide an even more complex message for the dog regarding the human they just licked. Whatever the reason, if your dog is performing unwanted licking, you can always distract her from the action and replace it with an action that you desire, like sitting calmly or doing a trick. Then you can reward the desired behavior and everyone is pleased. Never punish your dog for doing something that probably seems natural to her. It will only damage her trust in you. When the dogs licking becomes repetitive to the point of obsession. This can indicate a problem. Constant licking can quickly become a learned mechanism for dealing with stress. When it has reached this stage, it is the opposite of stress reducing and may require behavior modification and possibly medical intervention. In this case, the first thing that you should do if you notice your dog licking excessively is to check what’s going on and why. If nothing can be found but your pooch continues this practice for prolonged periods of time, it might be a good idea to call your veterinarian. You likely already knew that pacemakers help humans with heart conditions. 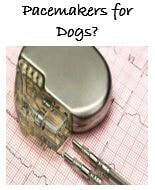 But our canine companions can benefit from these life-saving devices, too. If your normally gentle dog starts to become aggressive, there are reasons why this may happen.